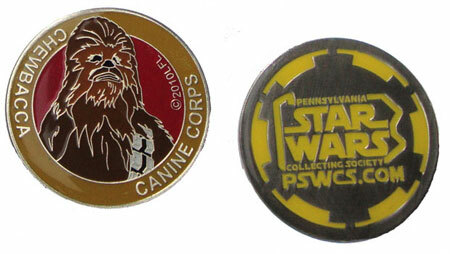 The Pennsylvania Star Wars Collecting Society is honored to support Canine Corps through a special charitable fundraiser. We will be selling medallions featuring Chewbacca, the beloved Wookiee from the original Star Wars Trilogy. The medallions were produced in a one-time run of 1000 medallions with the permission of Lucasfilm Ltd. All proceeds generated through the sale of these medallions will be donated to Canine Corps. You may order a maximum of two medallions. Ordering instructions can be found below. The primary mission of Canine Corps is to provide a no-charge "home away from home", including free veterinary care provided by the Animal Hospital of Rye, for the pet dogs of Pennsylvania (any branch, any permanent duty station, home of record: Pennsylvania) military personnel who have orders for Horn of Africa, Operation Iraqi Freedom or Operation Enduring Freedom. These are pets whose owners have no alternative for their dogs' foster care and safekeeping and would have to surrender them to a shelter or rescue. 100% of donations go towards the ongoing costs of the sanctuary to support the lives and welfare of the dogs. These medallions were inspired by the concept of "challenge coins" which are popular among military personnel. Given Canine Corps' efforts for deployed service members, PSWCS felt it to be a distinctly appropriate collectible to offer to support the charity. ALERT: Fewer than 20 medallions remain! The order period for this coin has ended. Thank you for your support!